Arts for Health works in partnership with facilities and estates and outside arts organisations to ensure that new environments and developments of buildings and ward spaces benefit from the involvement of artists and service users. A key example of this is The Redwoods Centre arts programme. It is an ongoing commitment by Arts for Health to continue to promote the importance of a positive, colourful and healing environment through the involvement of the arts. To support the 136 suite at St George’s Hospital in Stafford we have been working with a photographer and poet who facilitated workshops with service users to take photos and write words that inspire. This has been linked to a photography competition for staff and service users – to try to build up a body of landscape photography that will be used to provide a calming and welcoming environment within and outside the 136 suite. At Severn Fields health village in Sundorne, Shrewsbury, we work with Participate, a group of local artists and particularly Keith Ashford and Liz Turner, to develop sculptural artwork that will both enhance the environment, but more importantly will provide a privacy screen for people waiting for appointments; and contribute to a better acoustic environment. Liz and Keith held workshops for service users and staff to develop the design and construction of the sculpture. At Hall Court in Telford, we worked with a photographer to engage with service users – taking photographs of the local environment to develop into large scale artworks for the centre. 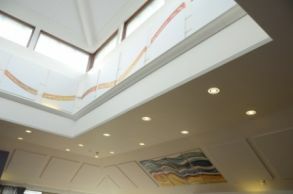 The participants have created a large body of photographic images which have been enlarged and installed in each of the consultation rooms plus the corridors and waiting area.